But I beg to differ… You see, although I devoted the first part of my professional life to word-smithing, I have discovered that there are things in this world that cannot adequately be expressed by words. Without a doubt, the visual arts rival the written word. For this reason, in mid-life, I returned to my first love—painting. And just as Mary Poppins’ sidekick Burt encouraged his audience to explore the world through his chalk paintings, I also seek to transport art viewers to another time and place. I usually begin an adventure with time in the “field” with my paint and canvas, or with my camera. Although I prefer to work from plein air studies, some safaris do not lend themselves to leisurely painting. And so, sometimes my camera must suffice. When I return to my studio, I sort through the many impressions that I’ve collected. Because I am particularly drawn to the interplay of light and water, compositions that feature both tend to make my short list. I find inspiration in the powerful symphony of rushing water or pounding surf; I am mesmerized by the dance of warm autumn light on lacy boughs or hillside folds. Both light and water, therefore, will take center-stage in my final composition. 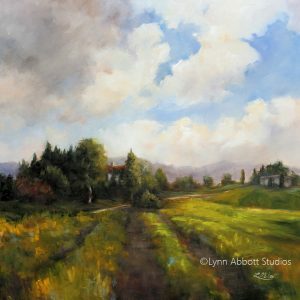 I paint primarily with oil because I find that it particularly expedites the blending and softening of my subjects’ edges and thus, allows me to more accurately capture the atmospheric condition that initially moves me: the soft hazy light of late afternoon or the blossoming of the dawn. Oil also facilitates work with both brush and palette knife to capture the various moods of water—peaceful or chaotic. If I believe I have captured the emotions of a place as well as its story, I feel that my work is successful. And if viewers imagine they can step into my paintings the way Mary and the children popped into Burt’s drawings, then I am absolutely delighted.